Which owl necklace to buy? 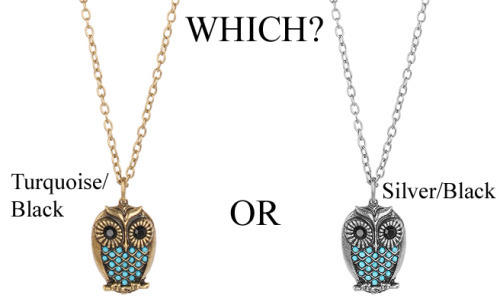 I can’t make up my mind which owl necklace should I buy, so would you fashionistas like to help me out? Let me know which one & why. I usually prefer silver over gold, but the turquoise stands out so much better on the gold necklace. That’s the one my eye goes to first. Personally, I like the silver. Silver goes with pretty much anything and really compliments the turquoise. But the silver is somewhat of a softer look. The turquoise stands out more against the gold, and is a bit of a bolder statement. But it really depends on the look you’re going for. The silver is sort of a peaceful, chill type of look, while the gold is more of an artsy look. I prefer the silver, but I’ve always been a bigger fan of silver anyway. I think the turqoise has better contrast against the silver. I think silver looks better with turquoise, so I would get the silver. I like the bronze one. I usually love silver, but the owl gleams in bronze. goldish one because it looks better. The silver one, because it looks a bit like old silver jewelry to me. I would go for the silver one, because it looks more real. What kind of clothes (and what sort of hues) do you like to wear? @lifeflame mostly cusual tshirt and jeans yet with a little edgy style to it & it’s dark hues of clothing, once in awhile bright colored. I usually prefer silver, but I think the turquoise is fab and the gold tone gives it that retro look. The silver goes better with black and turquoise IMHO. Either one is nice; do you mostly wear silver or gold earrings? i like them both – they’re both different. why not buy both if they’re cheap enough? I would get the silver one, but I don’t wear yellow gold, so I’m biased. My jewelry is all silver or white gold. i like the turrquoise and bc i still see that color in the silver. I’m not a big fan of gold, but that’s just me which appears from what I can see to be the color of the other necklace. They are nice lookin necklaces. I actually may be interested in the one on the right aswell. Where can these be found? @Robot No, I didn’t even get to buy them myself. Ikr but they didn’t restock at all. Jewelry Buffs: Which of these gold tie clips is a better buy? When wearing a necklace and a collared shirt, where should the necklace be worn?